Little is known of the death of Constable Morrison other than the following brief newspaper extracts. The Dubbo Liberal and Macquarie Advocate of 22 January, 1898 printed the following. 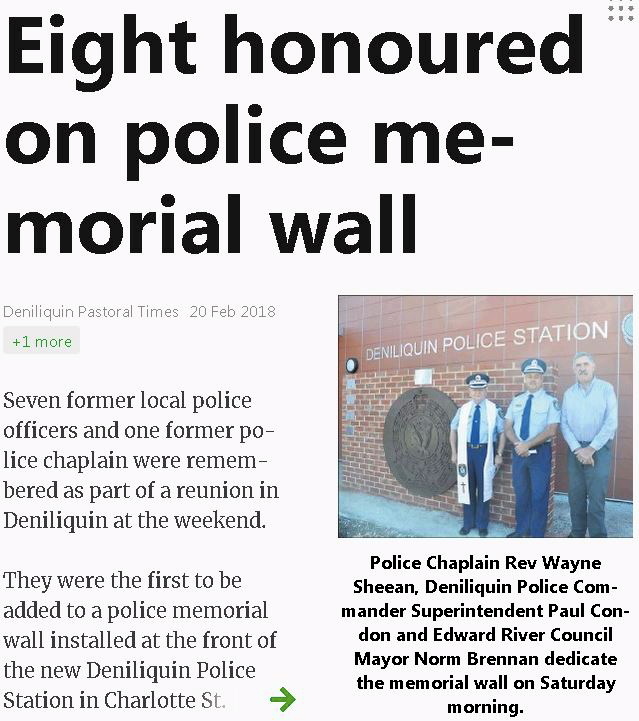 A wire from Deniliquin dated Wednesday says, “A telegram was received today announcing the suicide of Senior Constable Morrison, of Moama. The Small Debts Court was being held when the news was received by Mr. N. C. O’Neill, P.M., and he immediately adjourned the case on account of having to proceed to Moama to conduct an inquest. The news caused quite a sensation locally, as Morrison, who was previously lockup keeper at Deniliquin, was always regarded as a zealous officer. No cause is assigned for the deed. The Camperdown Chronicle of 22 January, 1898 also reported on the death, as follows. A CONSTABLE’S SUICIDE AT MOAMA. At halfpast 11 on Wednesday morning a report reached Echuca that Senior Constable Morrison, in charge of the Moama police station, had shot himself. Dr. Eakins was quickly on the spot, but pronounced life to be extinct. Deceased was highly esteemed in the police department, having been 18 years in the force. He was 40 years of age, and had been stationed at Moama for seven years. He leaves a wife and family of eight children, the eldest being 14 years of age. Deceased was on duty in the morning and appeared to be in good spirits until informed of the terrible accident which had befallen Mr. Miller, manager of the Bank of New South Wales, when he seemed greatly depressed. He, however, spoke to his wife, appeared rational, and started doing his office work. Suddenly his wife heard the report of firearms, and rushing in found her husband lying on the floor, with his rifle beside him. The bullet had gone into the mouth and blown the top of the head off. At the time of his death the constable was aged about 40 years and is thought to have joined the New South Wales Police Force about 1880. He was stationed at Moama. So far, I have not found any information as to what the initial ‘J‘ stands for ( in relation to his Christian name ). In NSW State Archives – Registers of Police, there is a James MORRISON – # ‘Q’ 3661 who was born in 1857 in Victoria and appointed to the Police on 15 March 1880. It is very possible that this James MORRISON is the J. MORRISON in this Memorial Post but that, at this time, has not been confirmed. WITH reference to notification in Government Gazette of 21st ultimo, appointing Senior-constable William Morrison to act as Clerk of Petty Sessions at Moama, — for Senior-constable “William” Morrison read Senior-constable ” James ” Morrison. TERRIBLE DISASTERS. DENILIQUIN , Thursday. A serious accident happened yesterday to Mr. Peter Millar, manager of the Bank of New South Wales at Moama. He rode a spirited horse across the Murray Bridge from Moama to Echuca Railway Station, where he saw a friend off by the train. He was about to return to Moama, when his horse became exceedingly fractious, and bolted. The animal careered madly for some distance, till near the railway crossing, when the saddle shifted to the animal’s withers, and the horse plunged and reared, and threw Mr. Millar on to the road, his head striking the metal, causing concussion of the brain, internal hemorrhage, and paralysis of the left side. No hopes are held out for his recovery. Additional particulars are to hand with reference to the suicide of Senior Constable Morrison, of Moama. Yesterday, on the arrival of the train from Deniliquin, he as usual went to the post office for the morning mail and seemed in the best of spirits. He was informed of the accident to Mr. Millar, with whom he was a close friend, and he immediately became depressed and walked into the police station. He then took down a Martini-Henry carbine hanging on the wall, and putting the barrel into his month, blew his brains out. His wife heard the report, and went into the room, where she found her husband dying on the floor, blood and brains being scattered all around. Morrison had been at Moama for seven years, and altogether eighteen years in the police force. Deceased was 40 years old, and leaves a wife and eight young children. Yesterday morning the inquiry, commenced the previous afternoon at the Police Court building, Moama, before Mr N. o. O’Neill, coroner, was resumed. On the previous afternoon Dr. Eakins‘ testimony was given. Janet Morrison, widow of the deceased, gave evidence to the effect that she last saw her husband alive on Wednesday morning, about 11 o’clock. He was then in the office at the police station. He arose that morning at about half-past seven o’clock, but had no breakfast – only a cup of tea. About a quarter past 10 he went out, when he seemed very low spirited. A few minutes before 11 he returned to the office. Witness did not then notice anything peculiar about her husband, except that he was very low spirited. She did not speak to him about it. He seemed to be in trouble, but had made no complaint to her about it. She left the office to make him a cup of cocoa, leaving him alone. She then heard the report of a firearm and, rushing back, found that her husband had shot himself. George Thomas Barber, a farmer, residing near Moama, stated be had been acquainted with the late Senior-Constable Morrison. On Wednesday he was driving past the police station at about 11 o’clock, when he saw Mrs Morrison run out. She called out to him, and he sprang over the fence and went in. He found deceased lying on the floor, with the rifle lying alongside of his body. The bullet had passed through his mouth, cutting his lip, and had gone out of the top of his head. Deceased’s hat was lying on the floor with the crown blown out, and the pugaree lying alongside. Witness ran across and told his mother, who lived nearly opposite, and got her to go down to aid Mrs Morrison. He then sent Henry Howard for the doctor. As there was no constable at the station he drove over to the look-up and acquainted Constable Flood. He had seen deceased several times lately, but he had not seen him under the influence of drink. William James Martin, Justice of the Peace, stated he had seen the dead body of the late Senior-Constable Morrison. He last saw him alive at about 25 minutes to 11 o’clock on Wednesday morning in Meninya street, opposite Chanter, Martin and Co.’s office. Just as he arrived witness and Mr Charles Opitz spoke to him about an accident which had occurred to Mr Miller. The deceased seemed to be rather cut up about the accident. They then dispersed, but, later on, witness and Mr Opitz again met, when it was remarked that deceased was not looking the same that morning as usual. When he last saw deceased he was going in the direction of the police station. It seemed to him (witness) that deceased had a worried look. He was not so bright in conversation, and seemed dull. He had known deceased for nearly seven years. Of late – during the past 12 months – he had not been so steady in his habits as previously. It was even more noticeable during the past three months. To his (witness’) knowledge deceased had been drinking more than he should have during the past week. Other wise he bore a very good reputation. He knew of no domestic troubles and, speaking from outside judgement, he never saw a father who seemed to look after his family better. He did not know anything about his financial position. Constable Schweicher, stationed at Moama, said he last saw deceased alive near the Federal store, opposite the Bridge Hotel, shortly before eleven o’clock. Witness spoke to him when he appeared to be despondent on account of Mr Miller‘s accident. When he left witness deceased went towards the police station. During the past few days witness noticed that deceased was worrying or fretting over something. He was not quite positive on this point, but he imagined that there was something peculiar about him. Usually he was of a distant and reserved disposition. After parting company with deceased witness proceeded on his way collecting returns. Half an hour afterwards he received a message to go to the barracks and he immediately went then. On arrival he saw the body lying on the floor of the office. Deceased was lying fully dressed, with his head against the wall and with fresh blood on his hands and face. Dr Eakins was then present. The regulation rifle ( produced ) was lying on his right side. It had stains of blood on it. The empty cartridge ( produced ) had been taken out of the rifle by Dr Eakins and it was lying alongside the weapon. The hat ( produced ) with the top blown out, was also found on the floor. The bullet had, apparently, gone through the ceiling of the office. He had known deceased for the last three years, but had only known him intimately for the last eight months — since he had been stationed at Moama. He searched the body and the office, but found nothing leading to the belief that suicide was contemplated. This concluded the evidence and the coroner found that deceased met his death by injuries to the brain and skull inflicted by a bullet. Yesterday afternoon the remains of the deceased were interred in the Moama cemetery, when a large number of citizens of Echuca and Moama paid a last tribute to one who had been held in such great respect in life. The Rev. J. C. Johnstone, M.A., conducted the funeral ceremony, and, in speaking of deceased at the grave, referred to his good qualities in life. The utmost sympathy was felt towards the bereaved widow and family. One of the most painful features of the sad case is that the widow and family have been left without adequate means of support. The Mayor of Moama ( Ald W. J. Martin ), who was an intimate friend of the deceased, on finding out the condition of affairs, at once took steps to help the bereaved family in their misfortune and has inaugurated a subscription fund. It is his intention to appeal to the country friends of the deceased as well as to those who reside in Echuca and Moama. The following donations have already been made :- Chanter, Martin and Co., £2 2s; Dr. Eakins, £2 2s ; C. L. Blair, £1 1s; W. Milledge, £1 1s; D. McLaren, senr., 10s 6d ; P. Mackey, 10s 6d. The Mayor of Moama will be pleased to take charge of further subscriptions..
to take effect from the 16th instant. — to take effect from the date of commencing duty. About four o’clock yesterday morning Senior-Constable Morrison, of Moama, brought to the hospital a man named John Turner, who was suffering from severe burns. Dr. Smith was quickly in attendance and he found that the patient had been burned along the right arm, the hip, and side, whilst his face was also badly seared. He stated that he went to sleep by a fire at his camp, close to the Murray bridge, and during the night a log from the fire rolled on him. His cries attracted attention, and Senior-Constable Morrison was informed. He found Turner in great pain and with the least possible delay had him placed under medical care. The wounds, though not dangerous, are of a most painful character, and will be some time before the man can leave the hospital. A man named McKenzie, alleged to be an old offender, was arrested by Senior Constable Morrison, of Moama, yesterday, on a charge of horse stealing. McKenzie called at the police station and offered to sell the constable a fine looking draught horse for 30s. The price asked was so low that Morrison became suspicious, and having read an account of a similar animal having been stolen from a Mr. Patrick O’Loughlin, of Myers Flat, near Bendigo, he detained the vendor. Sending a telegram to Eagle-hawk, he soon after received a reply giving a description of the horse stolen. As this tallied with the appearance of the horse in the yard, he arrested McKenzie, and soon found that he was an old offender, well known to the police, having served several sentences for similar offences. His last appearance was before the Echuca court. McKenzie was brought before the Moama court this morning and remanded to Eaglehawk. Constable Thomas Foss, ( ‘Q’ 5448 ) who has been stationed at Moama for a long time, has received promotion, and it is expected that he will leave Moama on Thursday next. Constable Foss will take charge of a station at Hatfield, near Balranald. During his stay in Moama he has gained many friends. A little boy, a son of Senior-constable Morrison, of Moama, met with a serious accident on Thursday. Whilst playing in the yard the little fellow fell, striking his forehead against a piece of wood. No particular notice was taken of the accident at the time. Towards Friday morning, however, the condition of the child became worse, necessitating medical assistance.